Do you ever wonder why God created you? The Bible spells it out plainly: God created you to showcase His glory—to enjoy it, display it, and demonstrate it every day to all those you encounter. After nearly 50 years of living as a quadriplegic, and dealing with chronic pain on a daily basis, Joni has learned firsthand the importance of glorifying God through the toughest of situations. Through this devotional, Joni will help you discover how to put God’s glory on display—how to say no to complaining and say yes to daily following God down even the most difficult paths. Along the way, you will find great comfort and encouragement by focusing on the one who longs to lead and guide you every step of the way, every day. Don’t ever think your life is too ordinary, your world too small, or your work too insignificant. All of it is a stage set for you to glorify God. 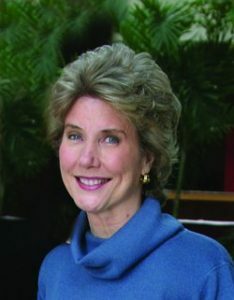 Many years ago I had the pleasure of reading When God Weeps by Joni Eareckson Tada. 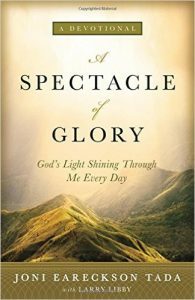 So, when I was offered the opportunity to review her new devotional, A Spectacle of Glory, I gladly accepted. Just as her book spoke to me, so is her devotional. She writes from a deep place. Her words are rich and full of substance. There is no fluff or superficiality. I relate to her, in that she knows what it’s like to suffer, and not get healed. She had a diving accident which left her paralyzed, and she has been a quadriplegic now for forty-nine years. She prayed that God would heal her, and went to several healing services, but was never healed. Yet, she never lost her faith, which is why she is my hero. I read A Spectacle of Glory every morning and it ministers to me. I highly recommend it. In conclusion, I want to thank Handlebar Publishing and Zondervan for sending me a complimentary copy in exchange for an honest review. There are times I’m so worn and weary, when the harshness and realities of life overwhelm me. 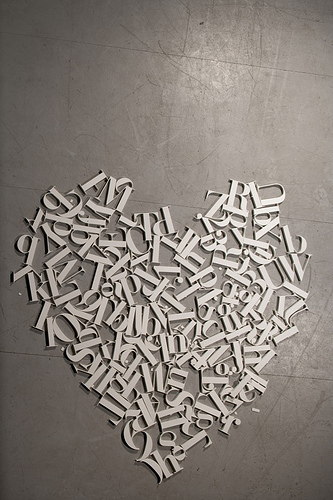 When I can’t find the words to encompass all that I’m feeling or experiencing. When my heart and soul grieves, I find myself writing poetry instead. Where is the sun in the clouds above? Sadness, disappointment, overwhelming the light. Accursed is Change and Goodbyes so hard. How would you respond when a friend drunk-dials you to make a prayer request? What do you say when you are furious with God, but aren’t willing to part with Him? How do you vent your frustrations to your Creator? When is it okay to be angry with God? I don’t usually read or review poetry. But I couldn’t resist reading and reviewing these poems written by the young and talented Amber Koneval. I admit, I was pleasantly surprised. I totally resonated and identified with her poems. What a gem to come across such a gifted poet. I found her poetry to be raw, truthful and relevant. She crafts her words with such depth, precision and artistry. I related to her poems as I have struggled in my faith with God. So I appreciated the authenticity and power of her poetry. If you love poems or even if you don’t, you are in for a treat reading Drunk Dialing The Divine. In conclusion, I want to thank eLectio Publishing for sending me a complimentary copy of this ebook to review. Amber Koneval is a college student in Denver, Colorado, double-majoring in English and Religious Studies. She is slated to graduate in December of 2013. Her poetry has appeared in such print journals as Time of Singing, The Wayfarer, The Storyteller, Bop Dead City and devozine (forthcoming). Her work has also appeared online formats at Crack the Spine and Exterminating Angel. 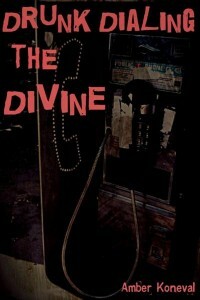 Her first collection of poetry ‘Drunk Dialing the Divine’ is now available from eLectio publishing. A place void of sin and full of beauty. If only I can see Him once again.